A few users pointed out that Quake2 support wasnt working - I've fixed that and labelled it 1.94.02. There's no need to download it unless you want Quake2 support. The new 1.94.00 release was not connecting properly to Counter-Strike servers - I've uploaded a new fix in the guise of 1.94.01. After what seems an eternity, I have prepared a new release. First the bad news - there's no Steam support. Yet. I hope to add it soon. The good news is Server Query now uses a more flexible method of storing information on the games it supports, which means adding games should be a lot quicker (and hence, you should see new games added more regularly). This did require some changes to the internal Server Query code - after you upgrade, you will have to re-enter where your games are installed. Sorry! The second pressing matter is that of server listings - the current ones are often way out of date, and there's been plenty of ISP representatives emailing me, asking how to get involved. Unfortunately, I've been so busy (and I've gotten so many emails from ISPs) that I stopped replying to them many months ago. However, I've devised a fix - an automated web-based system for ISP representatives to enter their listings through. This will require a minimum of oversight from me and should see SQ listings brought back up to date very quickly. See below for more details. ServerQuery is a free, light-weight dedicated server browser; allowing you to browse and connect to most popular games that utilise a dedicated server model. 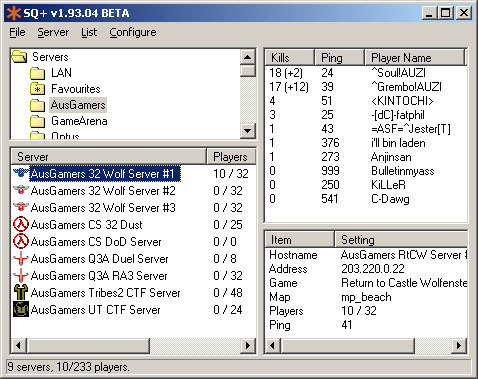 Unlike its competitors, ServerQuery comes equipped with lists of servers targetted to the Australian/NZ gamer; many of these lists are officially supported by the ISP providing the servers. ServerQuery is also a useful tool for use at LAN parties, able to quickly search for and display any servers running on the local network. Programmers and other users who believe in the open-source philosophy will be pleased to know that ServerQuery is provided under the GPL licence. Do you want to get your ISP's game servers listed in Server Query? Doing so is now easy - simply visit the List Administration interface page and enter your details. It should only take a few minutes and all listings are provided to SQ users free of charge. My answering of emails is _very_ patchy - if you email me with something that you should be able to solve yourself (or at the very least, someone on your favourite gaming forum could solve) I likely wont reply. Please understand I'm not trying to be rude, I simply dont have the time to answer every question about this software. With that in mind, feel free to use if you have a problem you can't resolve. © Nathan O'Sullivan, 1998-2003. 'Server Query' is provided FREE OF CHARGE and as such no warranty, either express or implied is provided. The author can not be held responsible for any damage to you, your machine, or anything else that occurs due to the direct or indirect use or misuse of this program. USE AT YOUR OWN RISK.